Just a few years ago, engineering student Fiona Edwards Murphy was looking forward to a rewarding career spent in the laboratory. The very last thing she expected was to co-found a successful business, travel the globe, and raise an eye-watering €1.5 million in venture capital for her firm’s work in monitoring the health of millions of honey bees in hives across Europe, North America and, very shortly, South Africa. But that’s how it all turned out. Recently, Fiona was awarded the Sodexo WMB Female Newcomer Award 2018. 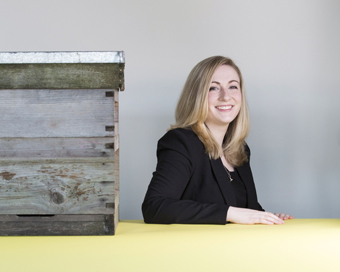 Although Fiona’s background was in engineering, her PhD thesis focused on the issue of honey bee health. Like nearly everyone, she had heard about the shocking decline in the world’s population of honey bees possibly, scientists believe, due to everything from climate change and the changing countryside, to a virus, pests, or the impact of pesticides. Fiona’s dissertation investigated the potential of placing sensors in honey bee hives to monitor everything from the temperature to the weight of the hive. Essentially, explains the 27-year-old CEO of ApisProtect, she was looking for a way to help honey beekeepers identify health problems in a hive. Because of the controversy and concern surrounding the plight of the world’s honey bees, her research into possibilities offered by hive sensors received significant media coverage. The next thing she knew, beekeepers from all over the world had begun to contact her about the sensors: “Basically, they wanted them!” she recalls. “I decided there could be a commercial application for my idea that large-scale beekeeping operations could find the sensors very helpful,” she explains, adding that in the USA for example, beekeepers run as many as 20,000 hives. And monitoring the health of a hive when there were such huge numbers involved, is almost impossible. Beekeepers, she realised, had really no way of knowing which hives may be in trouble. Last year Fiona and her colleagues decided to establish a company, ApisProtect: “We developed an absolutely new technology, a sensor that goes inside the beehive to measure temperature, humidity, sound and CO2 levels,” she explains adding that the sensor also reports back on the physical stability of the hive, and whether it has fallen over. “Essentially what we have done is created a box that beekeepers can install very quickly and it is minimally invasive. It is the same size as an old VHS cassette,” explains the entrepreneur from Kanturk, Co Cork. Right now ApisProtect is monitoring the health of more than six million honey bees, but by the end of this year that figure will have risen to over eight million. The company has partnered with the National Agricultural Genotyping Center (NAGC) in the US to analyse hive health. This monitoring will involve the company’s ApisMonitor in-hive devices installed by ApisProtect with bee health assessments and data provided by the NAGC in Missouri. “Over the next three years our objective will be to monitor 300,000 hives all over the world. All the data will be managed by our centre in Cork, where it is sent for processing. “We want to create a solution to the problems that beekeepers are facing. Currently up to 50% of hives are lost every year due to various issues. “It’s believed they are affected by everything form climate change to the changing countryside, pests, viruses and pesticides,” says Fiona, who spoke to WMB on her return from Louisiana where she had been installing sensors in beehives – and just before her departure to Florida for the same reason. “It’s been a massive change in lifestyle,” she admits, adding that her energy and determination for the work she does comes from the sheer potential of the technology to find a solution to the health crisis affecting honey bees, who are so crucial in plant pollination. “My motivation is that this is something that can make a difference to peoples’ lives – this technology has huge implications all around the world. “It’s very exciting; we have something that can help prevent losses in hives, and increase the production of the bees. It’s also all a bit scary, she admits: “It’s terrifying to put yourself out there pitching and presenting, because this is very new and it is not what I was actually expecting to do!